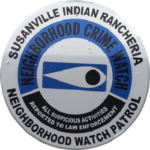 The Susanville Indian Rancheria, is implementing a “Neighborhood Watch” Program for residents of the Rancheria. Neighborhood Watch is set-up for the safety of the residents of SIR. Over the last several months, crime and suspicious activity has occurred both on the lower and upper Rancheria. We are concerned Tribal Members, who want to ensure the safety of our Elders, Children, and residents of the S.I.R. The Neighborhood Watch Program is a group of people living in the same area, who want to make the neighborhood safer by working together and in conjunction with the local law enforcement to reduce crime and improve their quality of life.